Available Colors: Blue with Blue Light, Silver or Black with White Light. Shipping Weight: Cello Bag, 500 per carton @ 29 lbs. 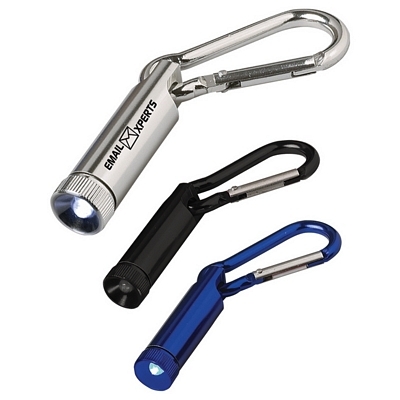 Customized Aluminum Carabiner Light Item #HT-115 (Minimum Order: 150). Promotional Flashlights like the Aluminum Carabiner Light can be personalized with your business logo and with No Setup Fees. 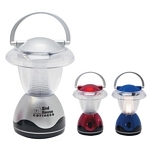 Customized Lantern Light Item #HT-123 (Minimum Order: 50). 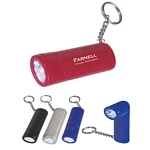 Promotional Flashlights like the Lantern Light can be personalized with your business logo and with No Setup Fees. Customized Dynamo Crank Flashlight Item #HT-117 (Minimum Order: 50). 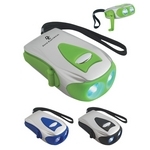 Promotional Flashlights like the Dynamo Crank Flashlight can be personalized with your business logo and with No Setup Fees.